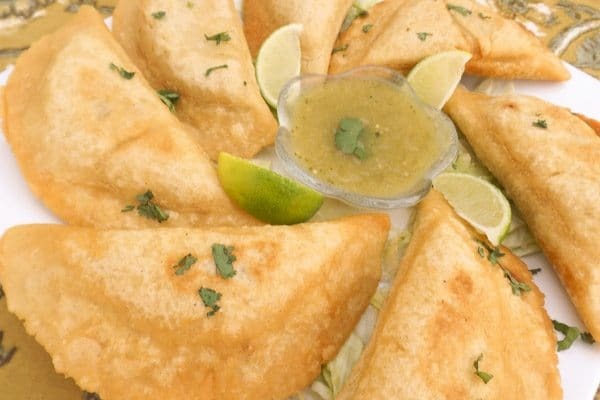 Mexican Empanadas with Green Sauce | Mexican Appetizers and More! 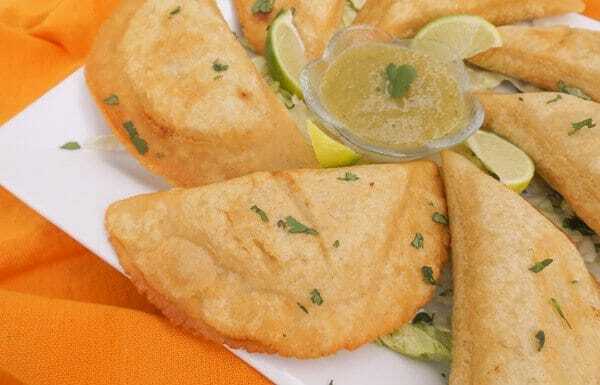 These Mexican Empanadas with Green Sauce are made with a tasty pork ground mixture within a corn masa dough, fried to crispy golden perfection and served with a delicious green sauce/salsa verde. 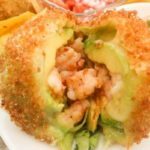 Excellent snack, appetizer or meal! 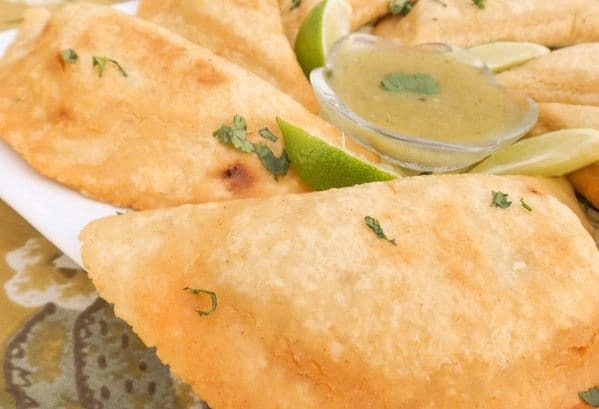 These Mexican Empanadas with Green Sauce are so good. 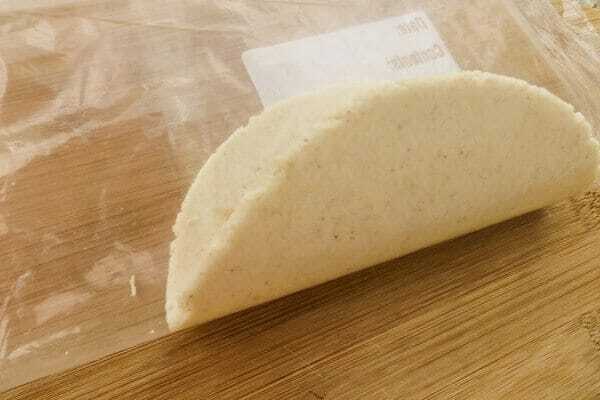 Quick, easy and is a non threatening empanada dough experience. So right away I’m going to say to you do not let the thought of making empanada dough intimidate you because quite frankly it’s simple to make. I know you can do it! 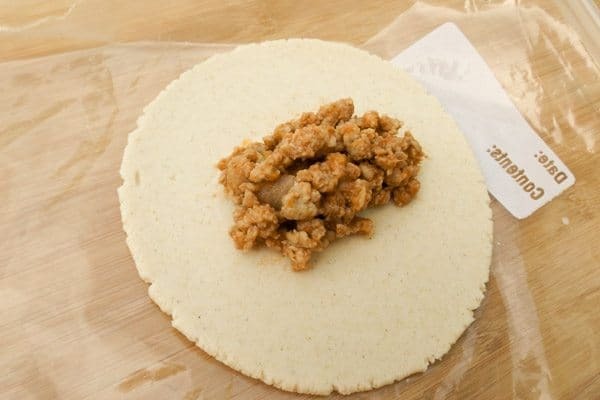 Plus you do not need a tortillera or tortilla press. 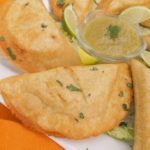 With a few simple steps, you will be making delicious homemade empanadas. 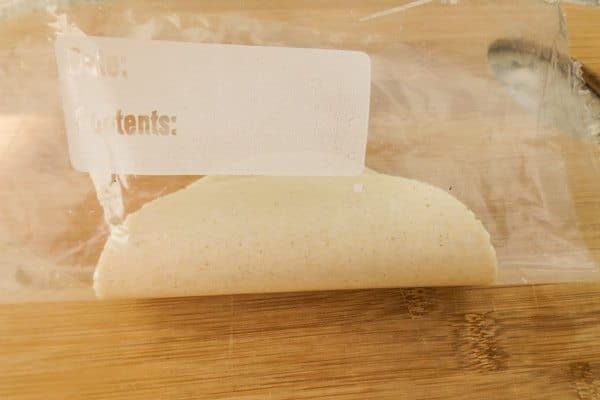 If you still feel like not attempting to make the dough or masa, just buy store-bought empanada dough found in the freezer section of most Latin grocery stores. You can make empanadas with practically whatever filling you like. Pork empanadas, chicken empanadas, beef empanadas or seafood empanadas. You can even make an empanada recipe, vegetarian. Consider maybe some portabello mushrooms with caramalized onions. Or maybe some spinach with ricotta cheese. Whatever you decide as a filling, it most likely will be delicious. Here for these mexican empanadas with green sauce, I chose, pork. 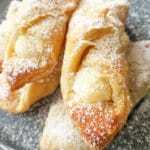 And hey, if you are somewhat concerned about your waistline, go with the alternative of baking your empanadas. Yes you can even bake them! Just be extra sure to seal them tightly or they may open up on you while cooking and leak out all the yumminess. Empanadas are usually serve with some sort of tasty salsa or sauce. For these as the name of the recipe states, it’s green sauce or salsa verde. If you have never had green sauce/salsa verde is a tomatillo, serrano based salsa and hyper-delicious. Trust me, you will be adding this sauce to your steaks, chicken, pork chops and even your eggs. It’s so good! 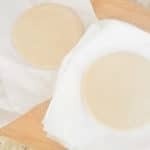 Okay, so how to make the empanada dough? I have included a few pictures to help guide you. You may also like this salsa for your empanadas…. With a heavy pot or cast iron skillet press down to form a disc. 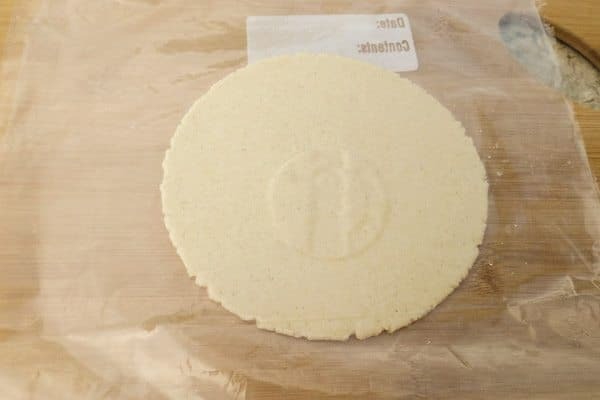 Fold plastic flap over to connect with the other side of dough. 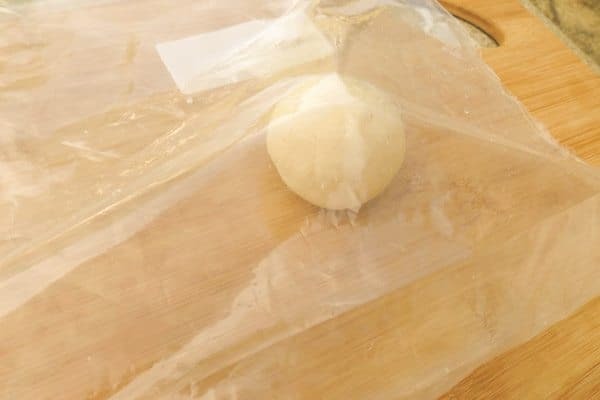 Seal by pressing down or pinching dough together. Remember you can also bake these in a 350 degrees F for 25 minutes. Just make sure to seal empanada really well using a fork or you stand the chance of having them open and leak all the yumminess out during cooking. In a nonstick pan cook ground pork over medium heat. Breaking up the meat with a wooden or plastic spoon. Cook until no longer pink. Add the chopped onions and garlic. 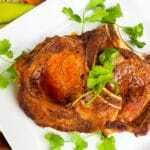 Cook until soft and aromatic. Add the tomato sauce, cilantro, salt and pepper to taste. Set meat aside to cool before filling empanadas. Remove stems of serrano peppers. Peel garlic cloves. Cook tomatillos, serrano peppers and garlic cloves in a saucepan with water to cover over medium heat. Cook for 15 minutes. 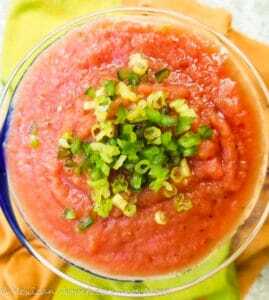 Drain and add all ingredients to a blender and puree. Add about a 1/4 cup of the chicken broth (or water) to sauce. If you prefer even a thinner sauce, add more. Note: do not taste the sauce at this point and get intimidated with the taste or the bitterness. After sauce sits for a few minutes, all the flavors come together. Take 2 cups Maseca Cornmeal flour and put in a medium bowl. Add 1 1/2 cups warm water. Add salt. With your hand mix and knead all together. Continue kneading for about 3 minutes until a large ball has formed. If you feel you need to add a little more water or a little more cornmeal, do so. Dough is ready when it is not sticking to your hands and fingers. 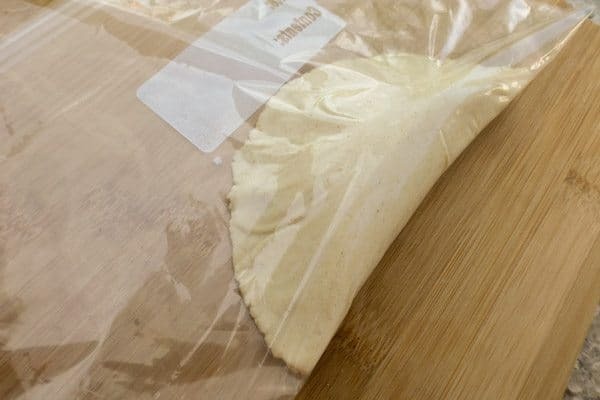 Set aside on a tray and place a damp paper towel on top of them to keep them moist as you work individually with each one to form the empanadas. Get a large Ziploc bag and open sides so that you have two flaps. Remove empanada from plastic and place on a platter. Cover with a damp paper towel. Continue and repeat the same process with the other balls until they are all formed. 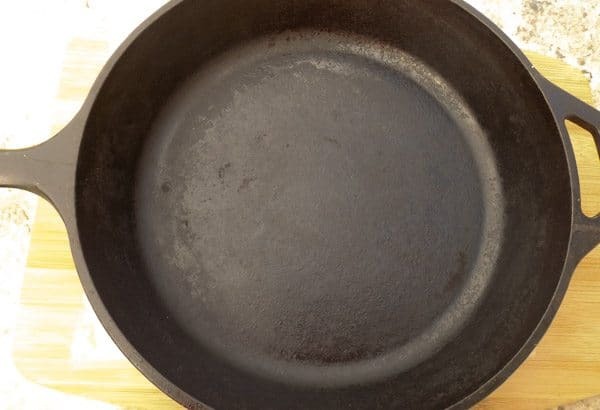 Heat up a skillet over medium heat with about an inch of vegetable or canola oil. Wait till oil is hot enough to add empanadas. Do not over crowd skillet or they will not fry well. Cook until golden brown on both sides. Drain on paper towels. 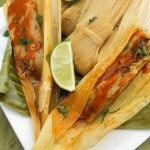 Serve immediately with Green Sauce/Salsa Verde dipping sauce. Take a bite and spoon green sauce each time you take a bite! Enjoy! When will you be making these Mexican Empanadas with Green Sauce?